We reviewed one of the cheap home theater projector available in market today, the new FastFox E07 comes with basic specifications at incredibly low price. As we expect from Chinese electronics products, this one too doesn’t come with a premium look and finish; but has got all functions normally a premium model offers. Keep reading our review to explore the specifications, built quality, performance and actual worth of the latest portable HD projector. 30W LED with 100 lumens brightness, 500:1 contrast ratio and 20000 hours of service life. Projection resolution of 640×480 and supports Full HD 1080p videos. Wide range of connectivity options include HDMI, SD memory card, USB, VGA input, RCA and A/V. multiple aspect ratios including 16:9 and 4:3. 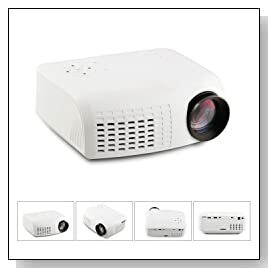 Though the FastFox E07 comes at incredibly cheap price tag, the home theater projector has got decent specification to produce good quality display. The projector supports 1080p full HD resolution and aspect ratio of 16:9. 100 Lumens brightness from 30W LED lamp is not so great for a high-end home theater system. Though the device produced good quality images and sharper videos, we felt that the model is not comparable with other expensive brands. The portable projector renders sharp and crisp videos when placed at least 2 meters nearer to the screen. Coming to the connectivity options, the new FastFox E07 has got all the ports you normally need. It supports HDMI input, USB for playback from flash drives, mini SD card slot, VGA and AV inputs. The portable device can be placed on desk or can be ceiling mounted. The model doesn’t come with distance sensors, you need to manually focus for better image quality. Material used for the outer case is quite okay, doesn’t feel superior but strong enough and not fluttering. 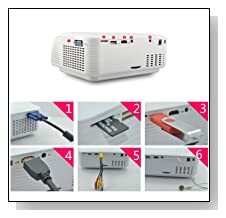 Overall, the FastFox E07 is the budget friendly LED projector suitable for small rooms with decent video watching experience. Possesses all enough specification for daily usage as television and movie nights but we are skeptical about its durability. Its cheap price tag makes it to try out for a small home theater setup. If you’re looking for a high-quality and durable LED project, we suggest to increase your budget and go for other premium models.